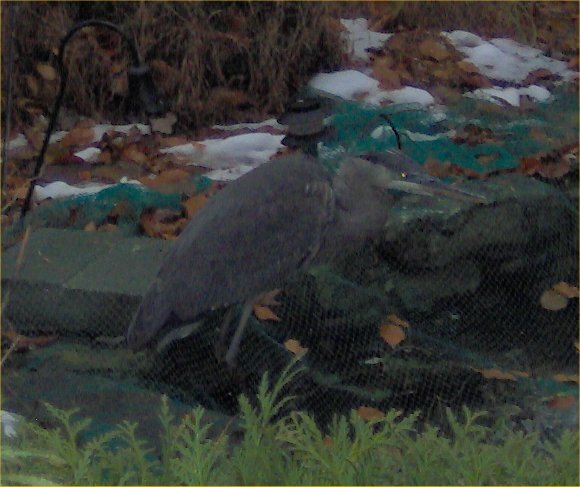 A juvenile great blue heron on our roof on 10/15/00 which overlooks my ponds. 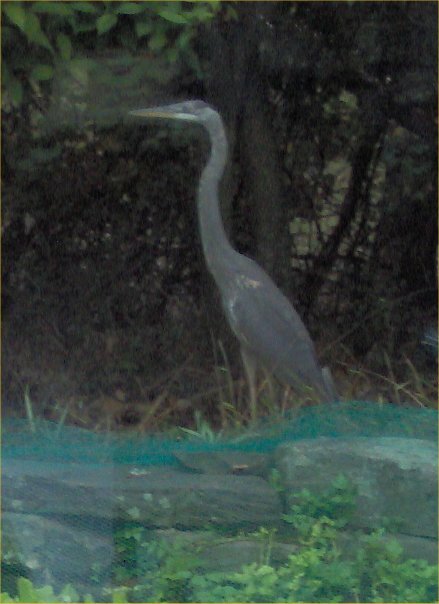 He/she did not get any fish because the ponds were netted, and the heron was skittish. See below under my experiences with herons for more information about this heron. I started renovating my bird pages in October of 2006. By July 2007, it was obvious they were not going to be finished if I added all the new information to the pages that I had initially intended. In order to get what I have written linked into the pages, I decided to just note which pages were unfinished and link them all in. This is one of those pages that is not complete. I am sorry. 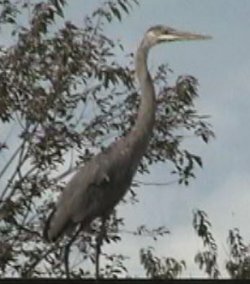 The great blue heron, Ardea herodias , grows 3 feet tall. There are actually 13 species in North America. All are gorgeous with blues and reds and fancy plumage. All will eat your fish if they can. 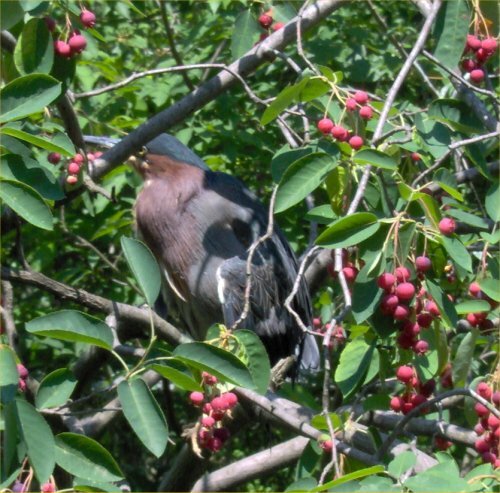 The green heron, Butorides virescens , grows to about a foot tall and may visit. 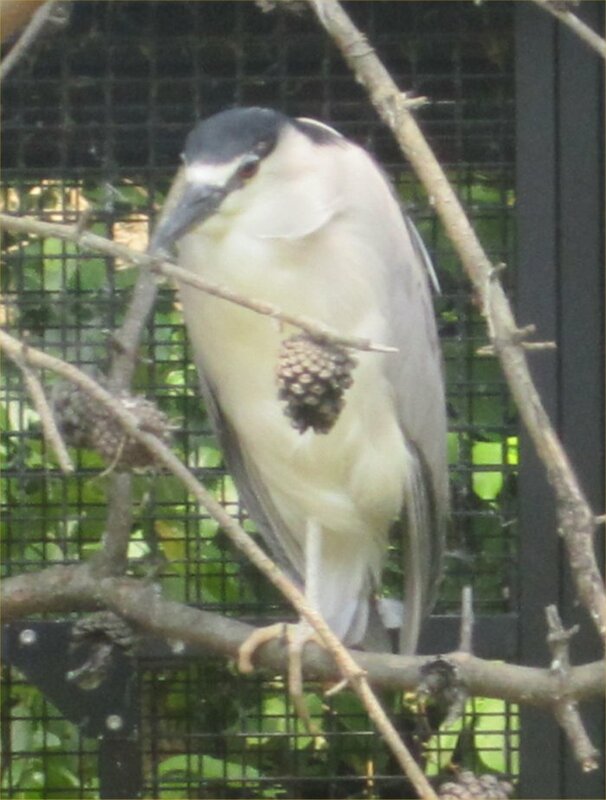 The night herons, like the black-crowned ( Nycticorax nycticorax ) and yellow-crowned, may visit your pond for insects, fish, and amphibians. They sleep during the day so if you see a 20-inch tall pretty heron eating at your pond when the sun is low, it is a night heron. This is a green heron, taken at the zoo on 6/7/06. Arey took these photos (see his page for more details). Lots of birds - this is a pond fish nightmare. 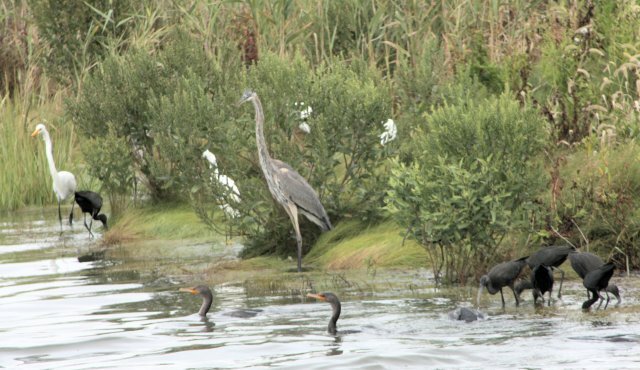 In the center is a great blue heron, on the left a great egret, a few smaller snowy egrets, lots of glossy ibis (wading black birds), and cormorants under the water (just their snake-like heads sticking up). Lots of birds - again. 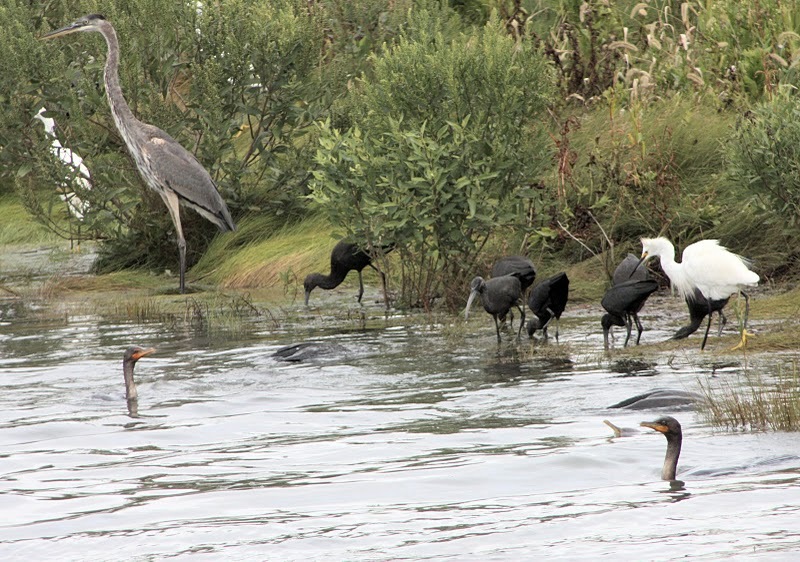 From left to right are a great egret, a great blue heron, glossy ibis, a snowy egret, and the cormorants in the water. 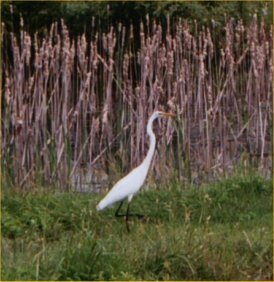 A great egret we saw at Lilypons on 8/31/03. 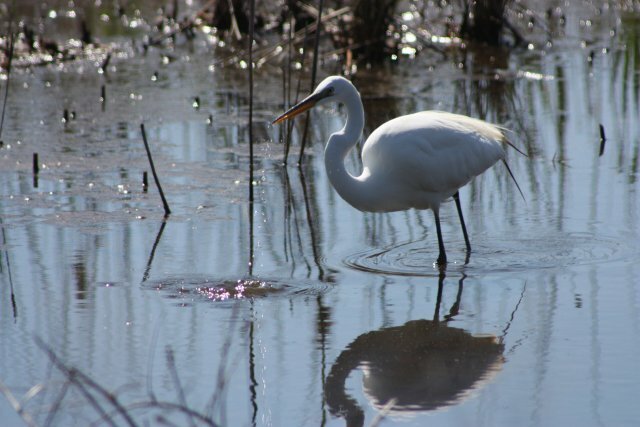 White egrets may visit your pond. They will eat your fish if they can wade in. Strategies to outwit them are the same as those for herons above. Egrets are beautiful white birds. 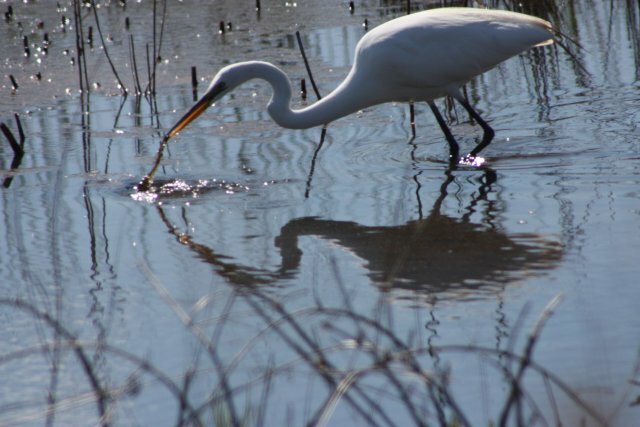 The common or great egret, Casmerodius albus , is a 32 inch tall white bird. 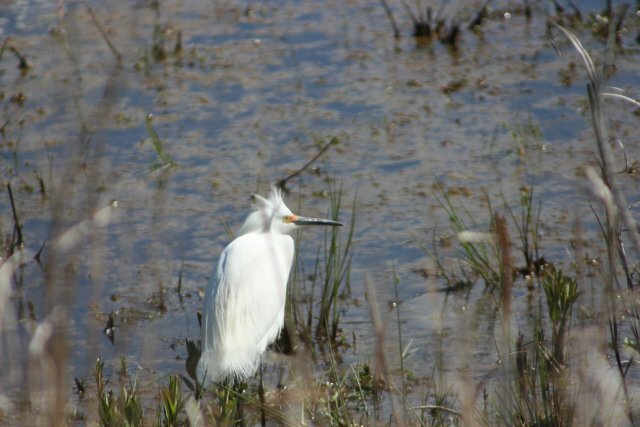 The snowy egret is 20 inches tall with a black bill instead of the common egret's yellow bill. The cattle egret only grows to 17 inches tall. Egrets, like herons, will stand perfectly still looking at the water for quite some time before moving. They do not seem real until they move. White egret - got something! See the two photos above under herons and Arey's photos as well for more egrets. Herons love to eat fish. They are most likely found at larger ponds with walk-in shallow areas up to about a foot deep. Reducing the walk-in areas, increasing the depth, and providing lots of plants and other hiding areas decrease the chance of fish being eaten. Other strategies include nets over the pond, electric fences (like the Fido Fence), fake herons (do not always work, some herons like company during breeding season), fake alligators or snakes, upside-down mouse traps around the pond, scarecrow looking squirters which spray water on moving objects (must have water hookup there), and stringing high tensile wire (or fishing line) about 2-6 inches off the ground around the pond. Because herons want to walk into a pond and apparently do not like to step over things, this last strategy seems to work for many people. AquaMart (see my pond catalogs page for contact information) sells something called a heron scarer which is a fake fish. When the heron tries to grab it, it pulls back, and the bird is supposed to be scared off. The method used by many pond nurseries is trained dogs who scare off the herons. It is illegal to harm or kill herons without permission from the government. See this list for other ways to deter herons and other animals from entering ponds. 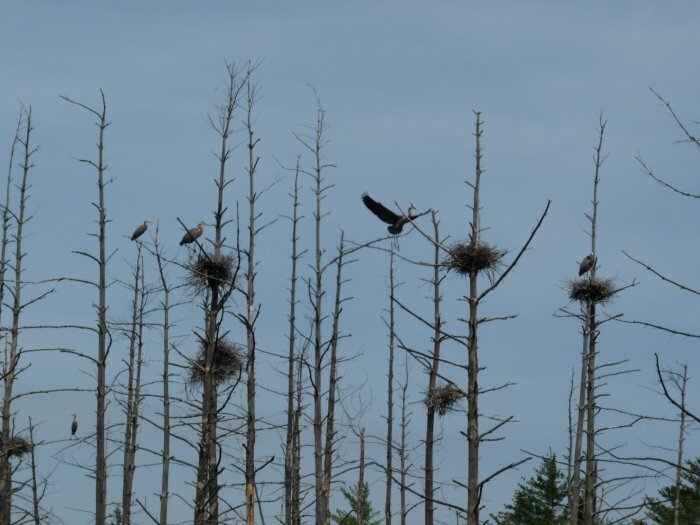 Check out this site for more information on thwarting herons. Kathy is the pond expert on herons! This is an archived version of the site which no longer exists. Help, Great Blue Herons are Eating my Fish! 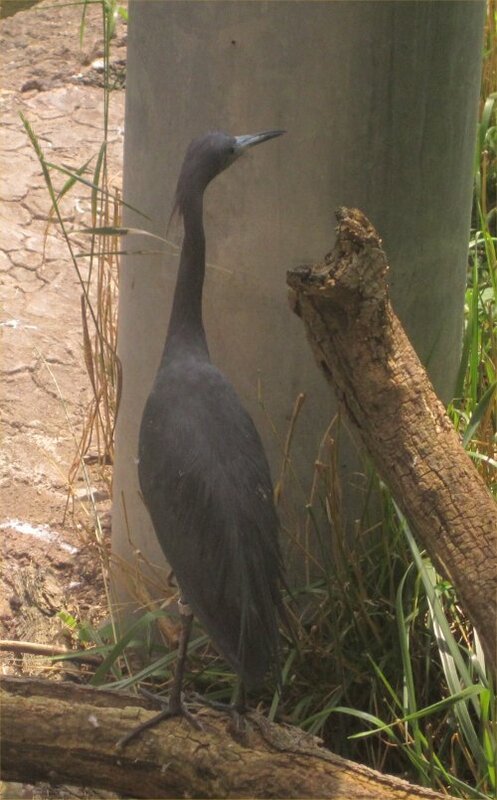 Here are links to a fake heron, a deer scarer (might work for herons), spray away (heron scarer, scarecrow sprayer), koi kastle (place for fish to hide), and an electric fence. All of these may help deter herons and protect the fish. 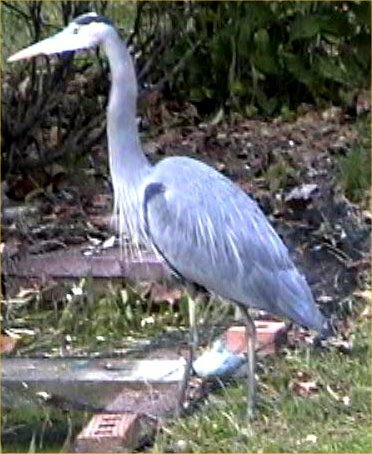 A great blue heron in our back yard on 3/19/04. There are more photos throughout the text below. 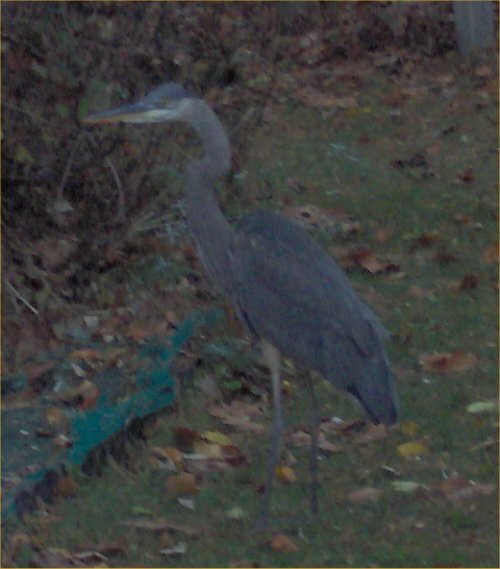 On 10/4/98, I had a juvenile great blue heron visit my pond. 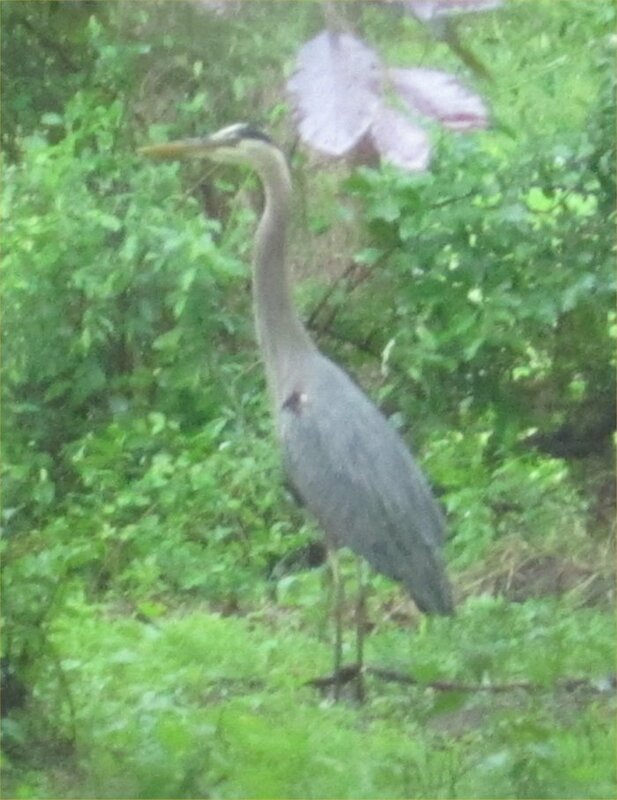 It was the first time I had seen a heron near my pond. Because leaves were falling, the net was on the majority of the pond except where the marginals were still sticking out. 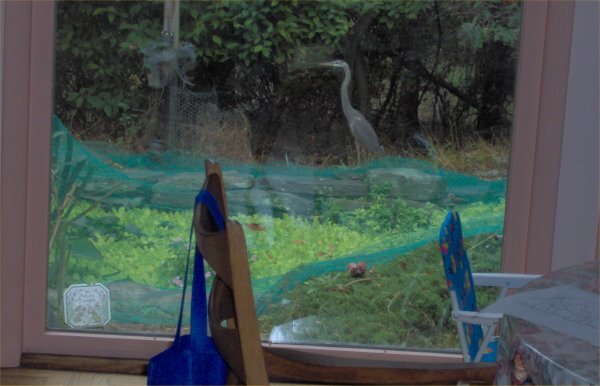 The heron alighted on the roof (10 feet from the pond), where I feed the fish, and at the top of the hill near the biofilter. Each time, it was touching the ground for about two seconds before it saw us through the window and took off. It spent the entire cloudy day trying to come in for landings but always saw us. The longest it was there, it eyed the fish with much interest but there was the net a whole foot off the water down the shear rock cliff. I had just removed huge amounts of salvinia which had been covering the entire surface. The salvinia had killed the algae so when I removed it, you could see to the bottom. The gorgeous reds and oranges of the fish no doubt peeked the heron's interest. As far as I know, it never got a meal. My father insisted it would eat all the fish, and my mother said I should go buy some dead fish to feed it! 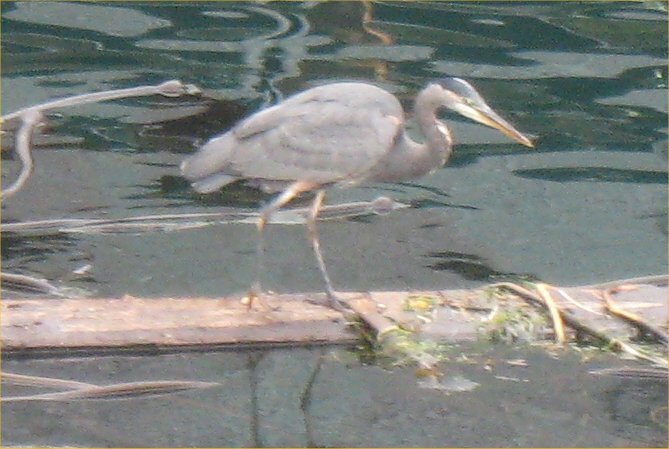 Herons much prefer live fish. Even with its mottled juvenile plumage, the heron was gorgeous. The only other visitor heron that has been seen so far was another juvenile in July of 2000 who landed in nearby trees for two days but never came down to the pond. Since the pond only has a net in the fall, this heron might have gotten some fish if it were not so scared to land on the ground. 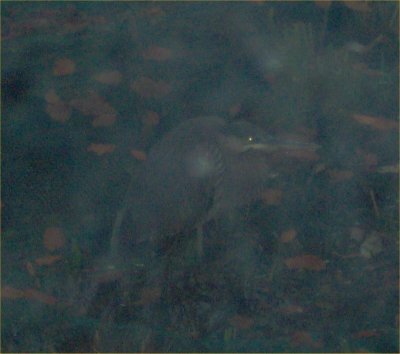 A heron returned on 10/15/00 and 10/16/00. His/her photo is at the top of this page. It may have been the one that came through in July. This heron was not so easily spooked. While we planted daffodils, he eyed us from the top of a cherry tree for a good half an hour. He also landed on the roof many times and at least once by/on the 1800 and 153 gallon ponds. My father saw him land on top of the leaf net on the 1800 gallon pond. He said the heron, being heavy, sunk the net down so that his feet were wet. It may be possible for the heron to peck at a fish through the net but I do not think he would get it through the net to eat it. 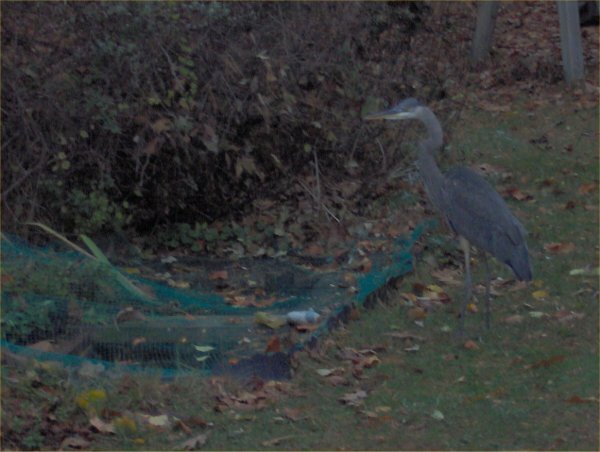 I then saw the heron standing next to the 153 gallon pond which was also netted. The heron seemed confused by the net but was keeping an eye out to see if any frogs came into view since that pond is usually ringed with half a dozen green frogs basking under the raised net. 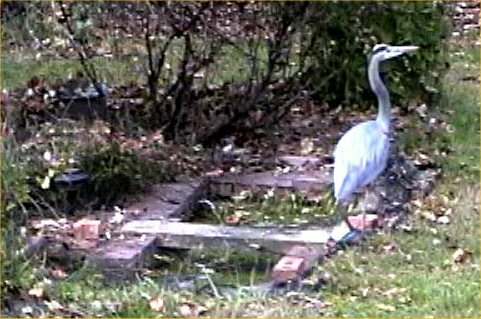 A heron visited my pond again in May 2003 for a minute one evening. I did not see him more than five feet from the water. The fish kept low in the deep end for a few days to protect themselves. 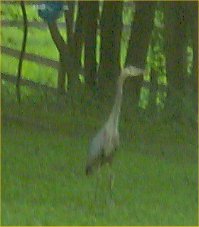 An adult heron was walking around our back yard the morning of 7/24/03. It was not near the ponds at the time and flew off in short order. My mother had seen one the day before. 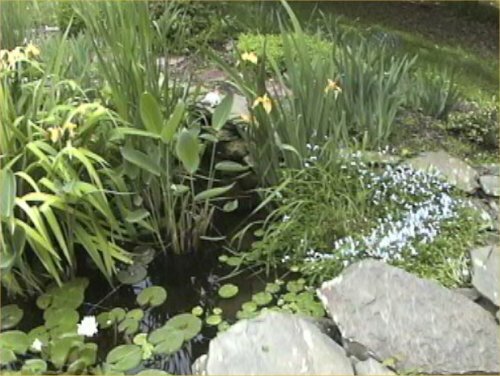 Since at the time, my ponds were completely covered in vegetation, the heron must have found the ponds either because he had been there before or due to the sound of the running water in the fountains and waterfalls. 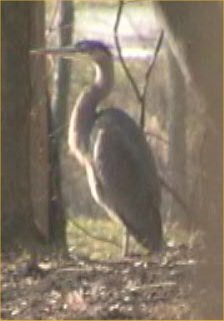 On 3/17/04, a great blue heron glided past the window at dusk. The next day, the fish were plastered against the bottom in the deep end, trying to jam themselves into the scant pots and PVC pipes. I figured there was no worry as before. 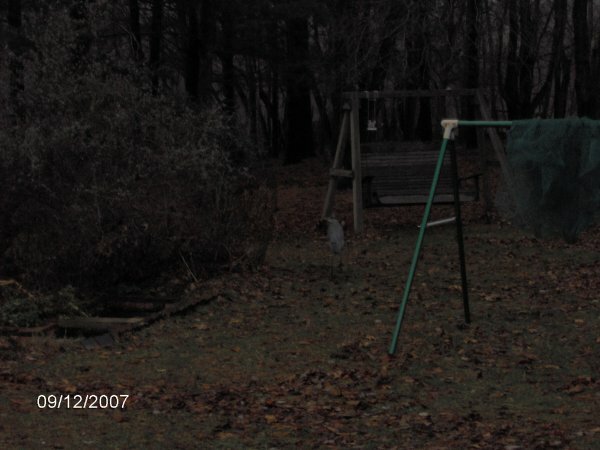 A few mornings later on 3/19/04, at dawn when I came downstairs, he was stand right in the middle of my pond! After seven years, this was the first time I had actually seen a heron IN my pond! He immediately flew off. The next day, my father saw him in the pond again. He got a photo on 3/19/04 of him on the lawn which I put at the beginning of this section. This one appears to be a mature adult. My two koi, four orfe, and favorite goldfish are still there but if the heron had caught the other goldfish or some minnows, I would never be able to tell. I hope he does not get any because for him, "Fish are like potato chips; you can't have just one!" See my April 2004 newsletter once it is out for more on this turn with the great blue. The heron hung around. 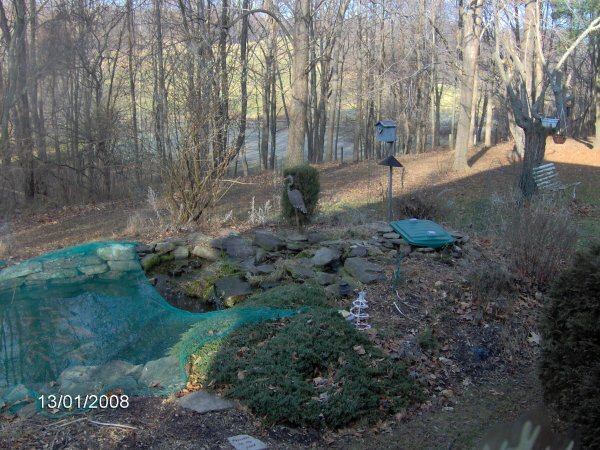 He was standing in the middle of the pond again on 3/25/04. 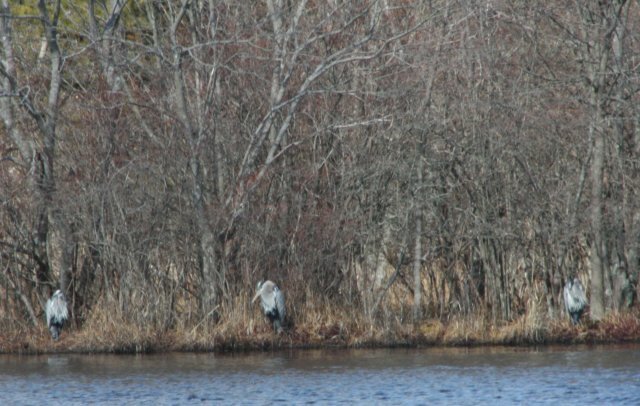 As of 4/15/04, the heron is still around! He is in the pond half the time I look out! He must be getting some smaller goldfish or my poor tadpoles or frogs. The bigger fish are fine huddled in the deep end though. 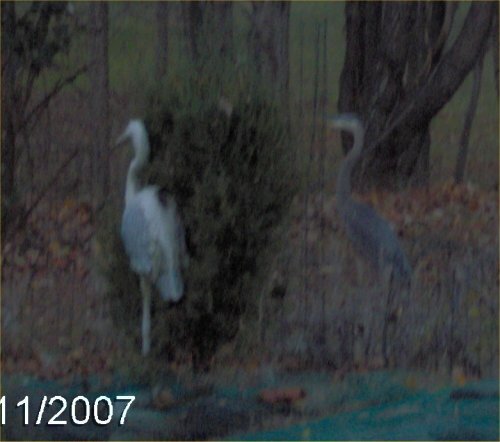 On 4/11/04, I moved to the window to see the heron up in the tree when to my surprise, two flew off! 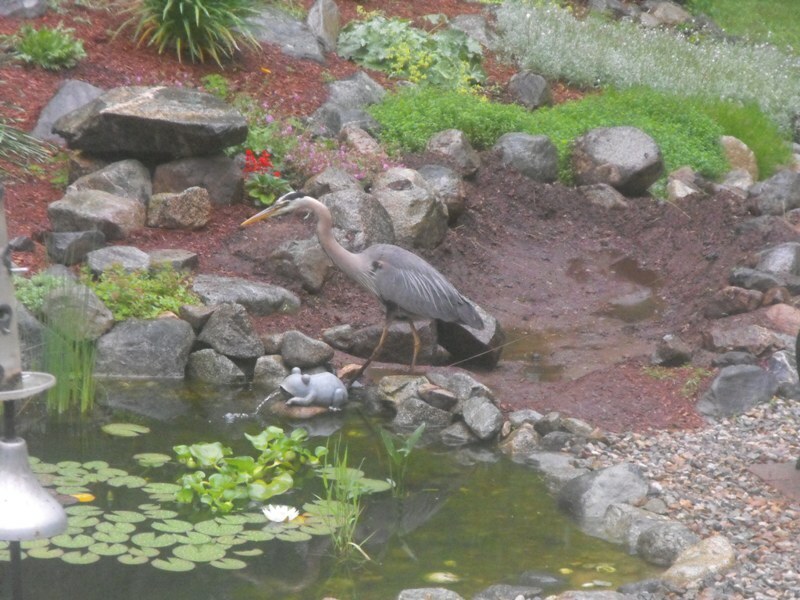 Yes, there were TWO great blue herons visiting my pond! Who knows, maybe there is a breeding pair now, poised to wipe my pond clean of any and all animal life not smart enough to stay in the deep end. I love herons but come on guys, move on now! The heron was there every single day! I noticed the morning of 4/17/04 that the fish were in bad shape. Many had torn fins, cuts, and some were bleeding. 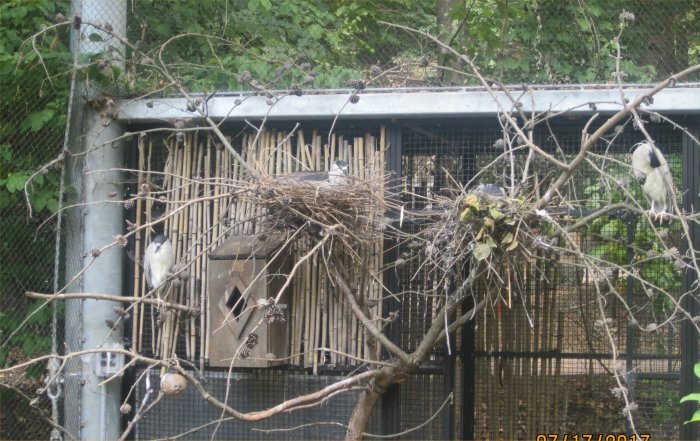 This was from their attempts to get away from the heron by jamming themselves into the rocks, pots, PVC pipes, etc. There did not seem to be hardly any frogs, tadpoles, snails, small goldfish, or minnows left. I decided enough was enough and put the old leaf net on the pond. 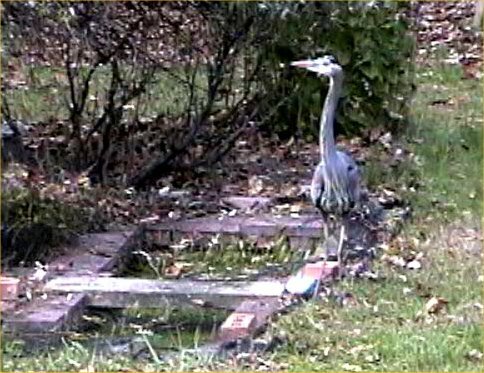 The heron did not seem to come back but then on the morning of 4/22/04, one was on the roof. A short time later, another flew out of a tree. I doubt it was the same one unless it was that quick at turning around. So, for now the pond is netted, squishing down the poor iris but it had to be done. I hope they will leave soon! I took the net off in early May, and the herons (a mated pair I guess!) returned a lot. My favorite and oldest goldfish, Jill, vanished. 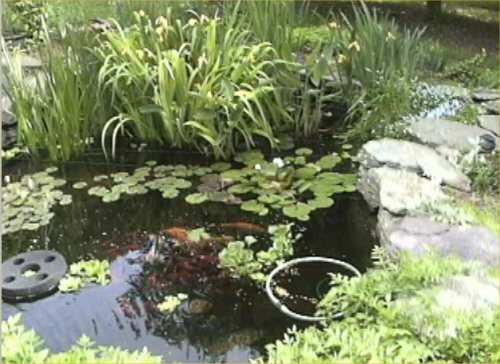 I then put up a number of strings of fishing line running across the pond on 5/6/04. This seems to have worked! I did not see one again until 5/14/04 but did not catch him in the pond (just the edge). I cannot watch the pond all the time but since the lines are intact, I assume the heron has not done much. For details of all of this, see my pond newsletters from May and June 2004 (on-line 6/13/04) and perhaps later as I put in a lot more information there as it happens. I also bought a "Pond Reef" from Willow Pond Aqua Farms. Again, my newsletter will tell you more. Everything I was told about herons and everything I believed about them was all a lie! See my June 2004 pond newsletter for the details. The deep open area of my big pond is now netted forever since the heron flies straight into 2 feet of water (no walk in area at all!). Why, after seven years without heron problems, is my pond now heron fast food? Too bad, the net stays on. Here is a photo of the fishing wire lines I tried stringing across the pond on 5/21/04. Here is another photo from the same day. The herons did not fish where the wires were but deeper. Hence, the net went on. 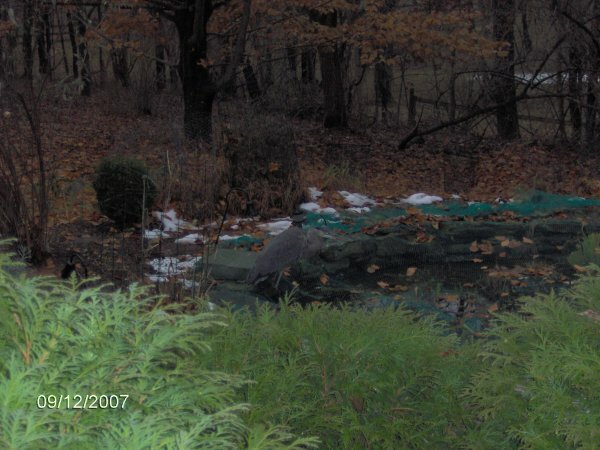 Heron - next to 153 gallon pond, facing north. Heron - facing the camera. 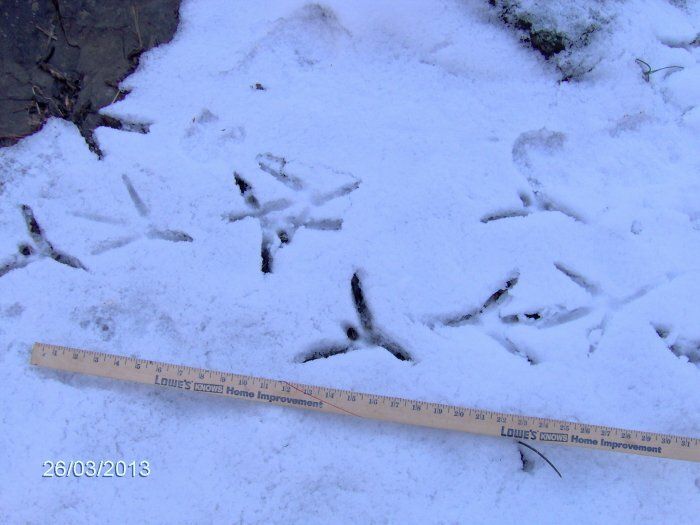 Here are some heron tracks that I took on 2/27/05 by my 1800 gallon pond. See how big they are! Read more about this in my March newsletter (on-line by 3/13/05). The heron was back on 11/27/07. I took a bunch of photos but only one was worthy of putting up on this site. 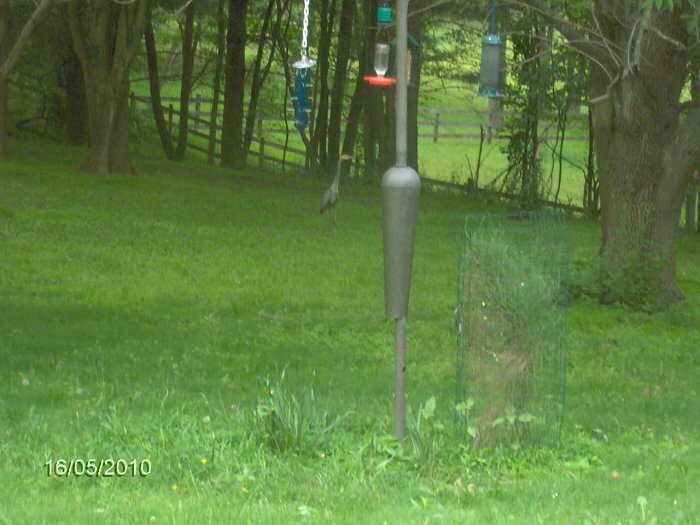 I put up the first one though because it shows the real heron standing what looks to be next to the fake heron. The ponds were netted and safe. 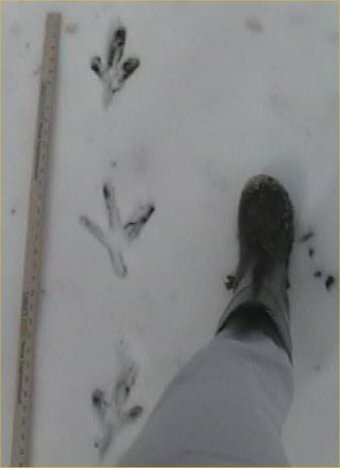 The heron returned on 12/5/07 when we got 4 inches of snow. I was at work but my parents said he was walking around my ponds all day. I normally have the nets off before it snows but had yet to do that (too many leaves all around) so the fish were safe. I also got two short videos of the heron, mostly flying away! He was very skittish so whenever he saw me, he flew off. I wanted to get video of him slowly walking. Heron - 771 KB, mpg movie. This video starts with the heron already in flight. Heron - 1207 KB, mpg movie. This video starts with him on the ground by my 153 gallon pond. I started this video after taking the photo above. I then knocked on the window to get him to fly off. I took more photos and videos of the heron on 12/9/07. It was dawn so I am sorry that the photos are pretty dark. He was no longer really scared of me so I got some outside photos. The videos are not great quality (they look better if you make them smaller). 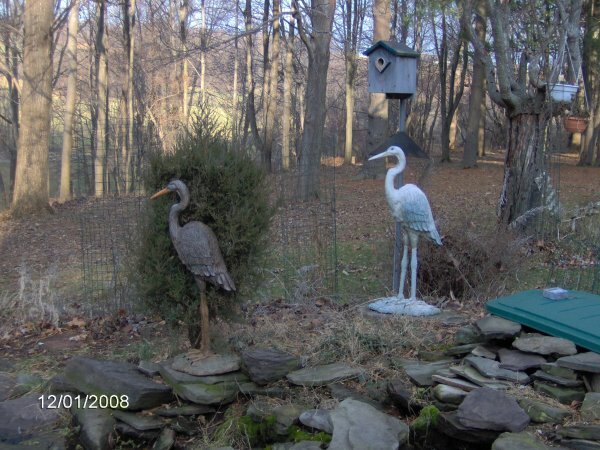 On 1/12/08, I took photos of my old fake heron and my new fake heron for comparison. 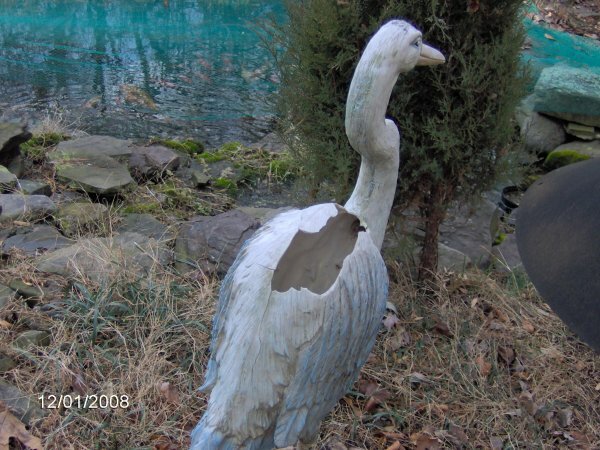 In the summer of 2007, yellow jackets moved into the hole in the fake heron. Since it had a huge hole, I finally replaced it with an identical one that really looks nothing like it. Old heron - see the nice big hole in it that I accidently put in the back a few years ago when using the sledgehammer to remove ice from the waterfall. 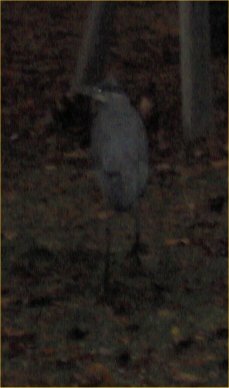 On 1/13/08, I took a photo of the new fake heron after I pruned the red cedar tree (that came up on its own) behind it. The heron came back on 4/16/10 to my pond and kept returning. Great blue heron in the front yard on 5/16/10. Great blue heron - close-up from the last photo. 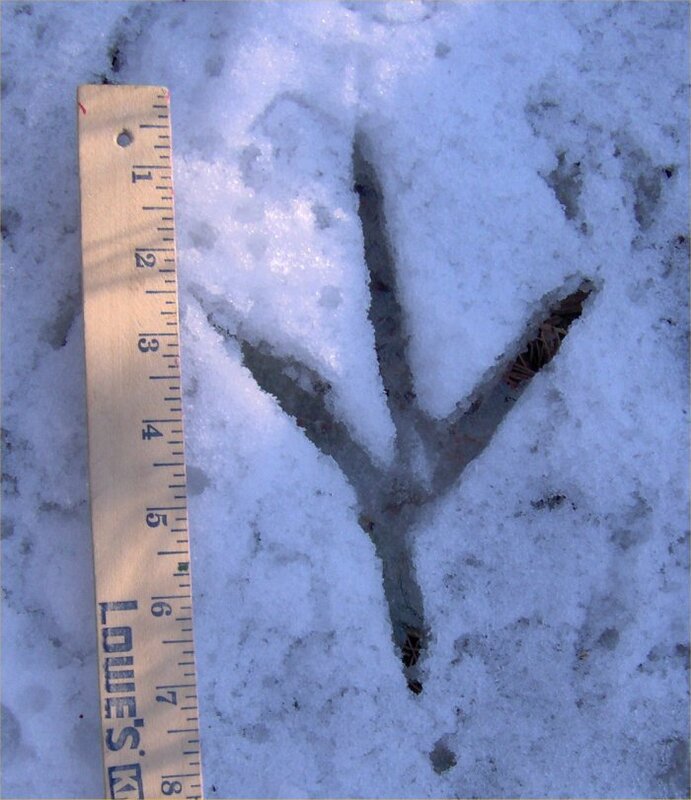 On 3/26/13, after four inches of snow the day before, I found 7" heron tracks in the snow by the 1800 gallon pond! 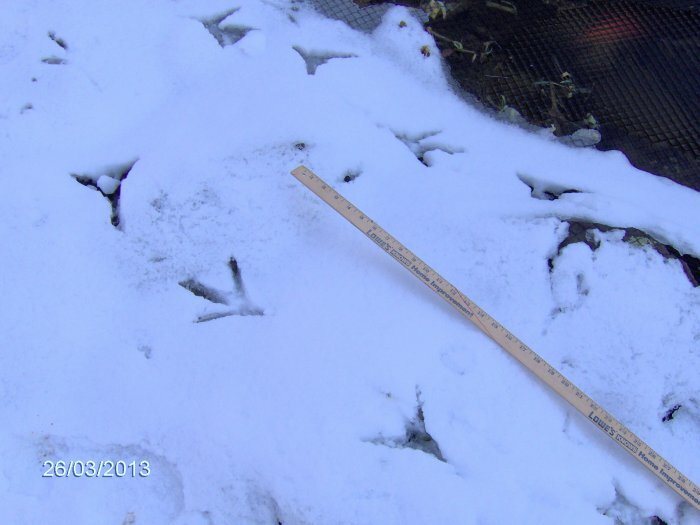 Here are some photos with a ruler. Great blue heron on 5/22/14. A heron was around in January of 2016. Read the stories in that pondblog. 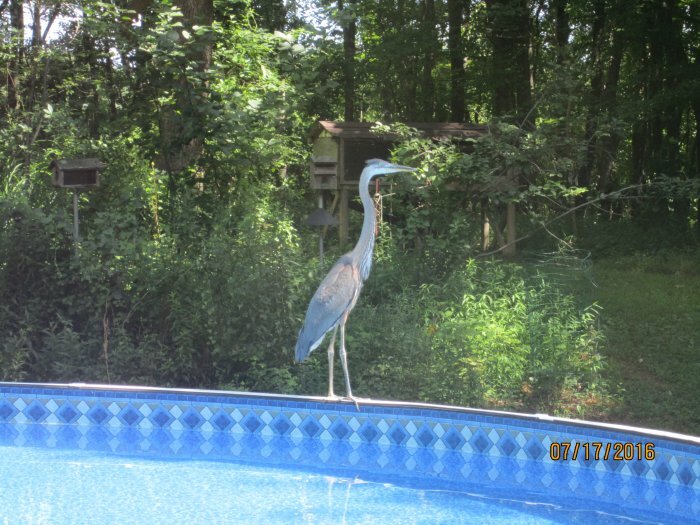 A heron was around on 7/17/16, and then he/she was on the rim of the pool. I got some really clear photos! On 7/17/17, we went to the Maryland zoo. 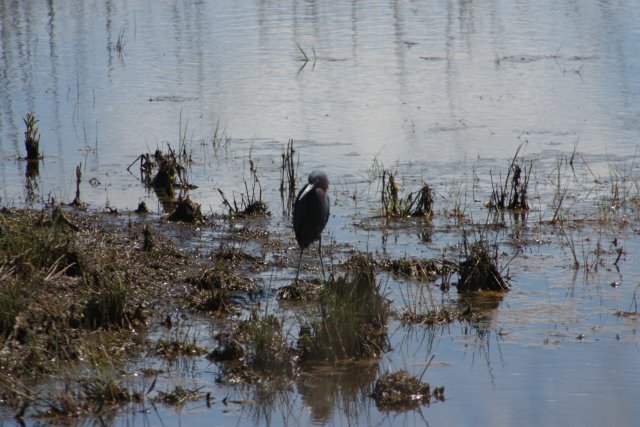 Here are some heron photos. Go to the Main Bird Index. Go to the Chicken Index. Go to the Turkey Index. Go to the Pond Bird Index. See the master index for the bird pages.